A heroin addict has been found guilty of killing a 100-year-old woman after he mugged her on a Derbyshire street for her handbag. Holocaust survivor Zofija Kaczan was battered from behind and knocked to the ground by lowlife thug Arthur Waskiewicz, 40, as she made her daily walk to church. A court heard the Polish yob attacked the widow because she was an "easy target" and was desperate for cash to buy drugs. He left the centenarian bleeding in the street with a broken neck following the harrowing assault, which took place in Normanton, on May 28 last year. Ms Kaczan was rushed to hospital and was able to give police a description of her attacker before she died on June 6. Waskiewicz was arrested at his mum’s London home where he was found hiding under a bed and later charged with manslaughter and robbery. Today he was found guilty of both charges by a jury of seven men and five women following a week long trial at Derby Crown Court. Waskiewicz, wearing a black velvet suit, remained emotionless in the dock with his head bowed as jurors returned their verdict following just over two hours of deliberations. He will be sentenced at the same court tomorrow (Thursday). The court was told how Ms Kaczan, who survived a Nazi concentration camp, was attacked as she made her way to St Maksymilian Kolbe Polish Church at 8.30am. 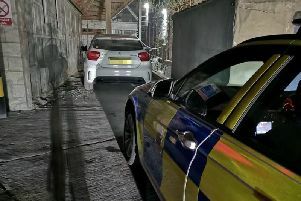 CCTV from neighbours showed her leaving her house last May before Waskiewicz was caught pulling over nearby in his Seat Leon. In a window’s reflection, another camera showed Waskiewicz, get out of the driver’s side, returning shortly after and speeding off. Her green handbag was found empty of cash and dumped nearby minutes later by a street cleaner while Waskiewicz, went to buy £20 of heroin from his dealer. After the attack she managed to make it to her church to ask for help before she was rushed to hospital with multiple injuries, including a fractured neck and cheekbone. She died from pneumonia and jurors were told the condition could only have been brought on by the injuries she sustained. Police arrested Waszkiewicz after his fingerprint was recovered from a receipt in the bag. He drastically altered his appearance by cutting his long hair and changed the insurance details on his car. The jury heard he was so desperate for cash that he had tried to sell his dog and asked neighbours for money. Waszkiewicz, of Wolfa Street, Derby, denied ever seeing the pensioner and told the court he was not responsible for her death. Prosecutor Kate Brunner QC told the court Ms Kaczan was a "sprightly" pensioner who had been in "remarkable good shape." She added: "She was small, on her own, vulnerable, an easy target for a man desperate for money.He spotted an easy target. "The pathologist will say she died of pneumonia and that she will not have died if she was not injured in that terrible way. "It must have been the robbery that caused the end of a 100-year-old life." A statement issued outside court on behalf of the polish community from St Marksmilian Kolbe, said: "We would like to thank all the people who have been involved in bringing the perpetrator of the crime against Sofoija Kaczan to justice. "It has been difficult for the community." Lynsey O’Donnell, from the Crown Prosecution Service, said: “The evidence in this case created a jigsaw that, when pieced together, showed no-one else could have carried out the attack. "We presented CCTV and mobile phone evidence to prove he was there at the time of the attack, evidence that he had stopped and got out of his car and that his behaviour afterwards showed he was hiding something more serious than finding and stealing a handbag. “One of the saddest aspects of this case is that an otherwise healthy lady has lost her life so that this man could satisfy his selfish desire for easy money.